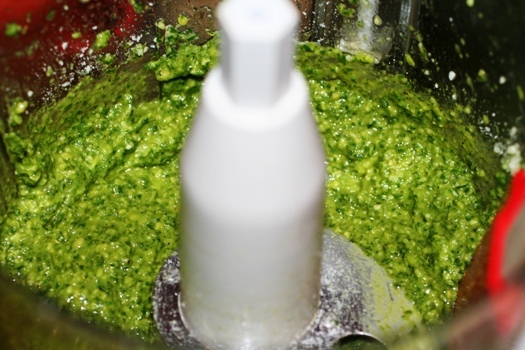 Every year when my basil starts overflowing, I pull out the food processor and prep as much pesto as I can for the rest of the year. My very first post on Faithful Provisions was my Harvesting Basil post where I first posted this recipe. 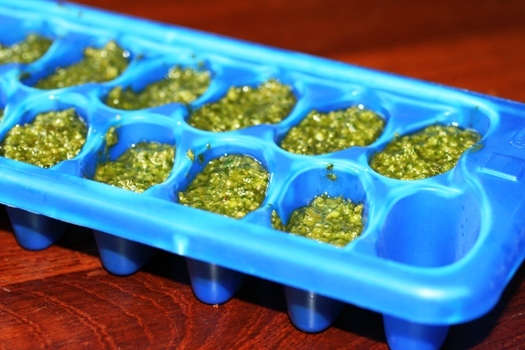 To make it easy to pull out for recipes, I freeze it in ice cube trays, then dump them into a freezer bag to use later. To keep the costs low, I use basil from my garden and I buy the other items in bulk at Costco. I get the Parmesan, pine nuts and olive oil in large quantities. I freeze the Parmesan and pine nuts (keeps them from turning rancid), because I get so much I can’t use it all before it will go bad. Into the bowl of a food processor, add the garlic, basil leaves, pine nuts, Parmesan cheese, salt, and pepper. Pulse until finely chopped. With the blender still running, slowly pour 1/2 cup of olive oil. That looks super yummy! I love pesto!